Where to use: Runners are designed to protect the surface beneath. 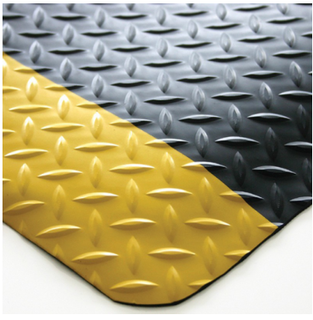 The Diamond Plate Classic Anti-fatigue Mat is suited to areas where mats must focus on both safety and foot comfort. The Diamond Plate Classic Anti-Fatigue Mat is designed to prevent slips, falls, strains and sprains in the workplace while improving productivity. Composed of tough durable, 4mm vinyl skin surface, the mat has an embossed diamond pattern to help prevent slips. The top surface is bonded to 12mm buoyant sponge backing for anti-fatigue quality. For safety there are bright, built-in yellow borders along both edges of the roll plus bevelled edges to help prevent tripping. Anti Fatigue Mat is available in mat sizes for individual work stations, custom sizes cut to length, and full roll lengths are also available.